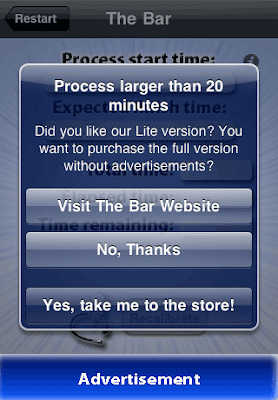 Do you want to try The Bar? We are proud to present the Lite version! On this version you can capture processes that are up to 20 minutes. This is a Lite version of our application, it is free, will never expire and has ads at the bottom. 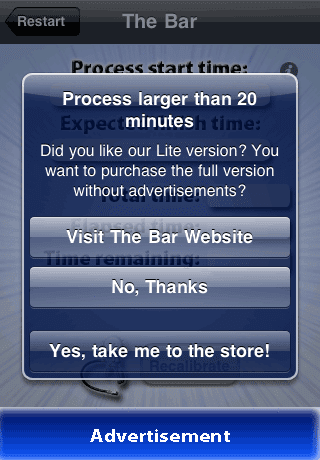 IMPORTANT: As the camera is key to providing the convenience to capture the progress bar, if your unit has NO camera, like the iPod touch, for example, you can use the free version without any limitations, in this case, the only difference with the paid version are the advertisements.